Inspired by the true life experiences of its title character, Antwone Fisher tells the dramatic story of a troubled sailer (Luke) who is ordered to see a naval psychiatrist (Washington) about his volatile temper. Little does he know that his first step into the doctor's office will lead him on a remarkable emotional journey to confront his painful past--and connect with the family he never knew. Opening weekend $210,013 on 15 screens. Rated PG-13 for violence, language and mature thematic material involving child abuse. It’s the old cliché: everyone in movies who doesn’t direct wants to get into that field. Many actors have made that leap, and the last dozen years has shown unparalleled success for them. Of the last 12 Best Picture winners, one-third of them came from directors who made their initial fame as performers. Ron Howard scored with A Beautiful Mind last year, and Mel Gibson took home the big prize for 1995’s Braveheart. Previously, 1992’s Clint Eastwood western Unforgiven and Kevin Costner’s 1990 oater Dances With Wolves grabbed the Oscar for their respective years. Before that, actors-turned-directors didn’t show quite so much success. Richard Attenborough won for 1982’s Gandhi, while Robert Redford took home the Oscar for 1980’s Ordinary People. From 1977, Woody Allen’s Annie Hall struck it big, but we then need to jump back decades for another actor-directed Best Picture winner. The only other example comes from 1948’s Hamlet. Maybe someday Denzel Washington will direct a Best Picture winning flick to go with his two acting Oscars – for 1989’s Glory and 2001’s Training Day - but he won’t do it with his directorial debut. For the first time, Washington took the reins with 2002’s Antwone Fisher, a film based on the life of its screenwriter. 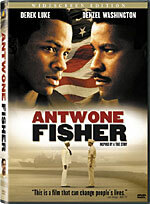 Fisher starts with 24-year-old Antwone (Derek Luke) in the Navy. We quickly see evidence of his hot temper, as he gets into a fight with a superior non-com. When he comes up on charges, his superiors reduce Antwone’s rank and order him to undergo a psychiatric evaluation. This sends him to three sessions with Commander Jerome Davenport (Washington). Mad at the world, Antwone displays a surly attitude and initially refuses to speak with Davenport. However, the first formal session doesn’t occur until Antwone starts to give Davenport what he needs, so the psychiatrist sits through numerous mute periods. Eventually Antwone decides to chat, and he suddenly proves to be a fountain of information. Antwone discusses his rough childhood. His mother had him while she was in prison, and she never pursued contact with him after she was released. Antwone’s father was murdered a few months before the boy’s birth. Antwone grew up in foster homes, primarily with Reverend (Ellis E. Williams) and Mrs. Tate (Novella Nelson). Mrs. Tate verbally and physically abuses Antwone and her other foster children. We also see some examples of sexual abuse by a “cousin” (Yolonda Ross) as well. While Davenport and Antwone work together, we see Fisher’s attempts to pursue a relationship with a fellow seaman named Cheryl Smolley (Joy Bryant). He clearly sees interested in her, but he displays an inconsistent attitude; we eventually learn more about the cause of his relationship problems. We also see examples of the chilly connection between Davenport and his wife Berta (Salli Richardson). All of this slowly leads to Davenport’s suggestion to Antwone that he seek out his living relatives, so much of the film follows this quest. I went into Antwone Fisher with exceptionally little foreknowledge of the story. I knew Washington directed it and that it came from the autobiography of the title character. I also figured it’d be uplifting in some “triumph of the human spirit” way. I didn’t get more than what I anticipated from that small group of expectations. 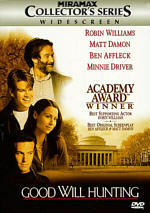 Fisher really comes across as little more than a modified remake of Good Will Hunting, though this flick doesn’t try very hard to make Antwone look special. That’s actually not necessarily a bad thing, for it’s good to see a movie that doesn’t focus on a savant of some sort. Hey, ordinary people have problems too! Unfortunately, that doesn’t particularly translate to an interesting story. Obviously Antwone did make something of himself; heck, the guy sold a screenplay based on his own story. However, the movie doesn’t explore anything particularly special about him. The character comes across as no one especially compelling. Derek Luke’s exceedingly low-key performance doesn’t help. Granted, it seems clear that the real Antwone is a pretty subdued guy; in this DVD’s supplements, we meet him and see his general tone. However, Luke comes across as nearly comatose much of the time. Actually, he handles Antwone’s occasional moments of anger well; during those scenes, Luke shows a spark. Unfortunately, the spark never ignites, and Antwone seems really dull and wooden much of the time. The fact that Luke has to work against Washington doesn’t help. He’s such a skilled and natural actor that he inadvertently makes Luke come across as weaker than he otherwise might. I don’t want to harp on Luke too much, but I think his lackluster performance actively harms the film; his bland presence makes it much tougher to get involved in the story. As a director, Washington does nothing particularly wrong, but he doesn’t give the film much life. We’ve seen this story before, and Washington fails to create anything particularly interesting or compelling with it. The film feels slow-paced and excessively long, and the predictability of the plot doesn’t help. Much of the tale appears obvious, and at times it falls into TV movie. Actually, it digresses into public service announcement territory on occasion, as Washington telegraphs too many points. Ultimately, Antwone Fisher means well, and it seems like a sporadically interesting project. Unfortunately, it suffers from a sense of “been there, done that”, as it fails to create anything particularly distinctive or compelling. The exceedingly low-key performance of its lead doesn’t help matters. In the end, Antwone Fisher seems like an unspectacular debut for Denzel Washington as a director. Antwone Fisher appears in an aspect ratio of approximately 2.35:1 on this single-sided, double-layered DVD; the image has been enhanced for 16X9 televisions. The picture reflected the film’s somewhat low budget origins, as it looked generally good but moderately flawed at times. Sharpness usually came across as acceptable. Some wide shots appeared a little soft, but these instances didn’t appear terribly intrusive. Mostly the flick seemed reasonably concise and distinct. Jagged edges and moiré effects created no concerns, but some moderate edge enhancement occasionally became a distraction. As for print flaws, the image looked a bit grainier than I expected, and I also noticed sporadic examples of speckles and grit. Fisher displayed fairly vivid colors, but they occasionally came across as somewhat heavy. They varied across the board. For example, at a Mexican club, colored lighting seemed somewhat loose and runny, but in the ship’s bunks, red lighting came across as tight and well defined. Usually the hues seemed fine, but these exceptions occurred. Black levels appeared somewhat inky at times, though they usually appeared solid. Shadow detail was a little dense on occasion as well. Ultimately, much of the time Antwone Fisher looked fine, but the image faltered enough to knock down my grade to a “B-“. The Dolby Digital 5.1 soundtrack of Antwone Fisher displayed no real problems, but its lack of ambition kept it from greatness. The soundfield mostly focused on general ambience. The mix stayed oriented toward the front much of the time. Music showed decent stereo imaging, and effects blended together reasonably nicely to create a decent sense of ambience. Surround usage mostly reinforced the front elements, though some unique material appeared at times. The Mexican nightclub created a fine spectrum of audio, and thunderstorms also brought the rear speakers to life well. Otherwise, this chatty flick stayed oriented mainly on the front. Audio quality appeared good. Speech sounded natural and warm, and I noticed no signs of edginess or problems related to intelligibility. Music appeared subdued but rich and distinct, as the score was clear and tight. Effects also came across as accurate and rich. The music at the Mexican club seemed especially fine, as it displayed loud and deep bass response. Ultimately, the soundtrack of Antwone Fisher didn’t do much to impress, but it worked fine for the film in question. This DVD release of Antwone Fisher presents a decent roster of extras. 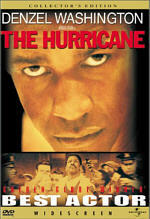 We start with an audio Commentary from actor/director Denzel Washington and producer Todd Black, both of whom sat together for this running, screen-specific piece. Overall, this track seemed pretty solid. It started slowly, and Black dominated the first fourth or so of the film, as Washington appeared to need a little time to warm up to the format. However, he eventually became significantly more active, and the pair provided a reasonably lively examination of the flick. You won’t find anything revelatory here, as Washington and Black mainly covered the usual basics like casting, locations, the script and general production notes. It was interesting to hear Washington relate how he approached directing, especially when he discussed direct influences. The pair provided a bit more fluffy praise than I’d like, but in general, they gave us a fairly useful and interesting commentary. Next we discover a documentary called Meeting Antwone Fisher. This piece lasts 14 minutes and 10 seconds as it mixes movie clips and interviews with screenwriter Antwone Fisher, actor/director Denzel Washington, actors Joy Bryant, James Brolin, and Salli Richardson, and producer Todd Black. The program covers Fisher’s past, with a particular emphasis on how his time in the Navy helped him. We also get information about how Black helped Fisher to become a screenwriter and bring the project to fruition. Some good material appears, especially when Fisher gives us his real-life details, but the entire package seems so gooey and sappy that it falters. The tone gushes about the Miracle of Antwone too much, which undercuts the more useful bits. To a degree, more of the same pops up in The Making of Antwone Fisher. The 22-minute and 13-second documentary combines film clips, behind the scenes shots, and interviews with Washington, Fisher, Bryant, Richardson, actor Derek Luke, editor Conrad Buff, director of photography Philippe Rousselot, Black, production designer Nelson Coates, and production sound mixer Willie Burton. They cover some basics of the film’s creation and its casting plus a mix of other production details. Some of the better elements relate Washington’s jitters about directing plus the way he eased himself into that role. Too much generic praise appears, unfortunately, so while “Making” includes some good material, it remains rather light and puffy. After this comes Hollywood and the Navy, a four-minute and 40-second featurette that concentrates on official military involvement in Fisher. It uses the same format as the prior piece, and we hear from US Navy Public Relations Officer Lt. Tanya Wallace along with Black, Coates, Washington, and Fisher. The more interesting moments relate the way that 9/11 affected the production, and we also learn of how the Navy worked on the film plus tidbits about locations and Fisher’s time in the military. A modicum of interesting notes appears, but again, the tone makes it less than stellar; mostly it tells us how great the Navy is. 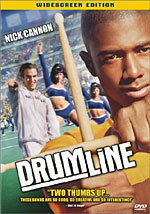 Lastly, the DVD includes Theatrical Trailers for Le Divorce, In America, Master and Commander, and Drumline. No ad for Fisher appears, but since Drumline includes the trailer for Fisher but not one for itself, I guess that makes some sort of perverse sense. While I wouldn’t call Antwone Fisher a bad movie, it seems like a relentlessly ordinary one. New director Denzel Washington does little to make it stand out from the crowd, and the overly long piece comes across as somewhat dull and bland. The DVD offers acceptable but unexceptional picture and sound along with a decent set of supplements. If you liked the movie, you should enjoy this DVD. Otherwise, I can’t recommend more than rental, and even then, it should only be for folks who really think they’ll enjoy this kind of tale; it did little for me.